Tempura, or lightly fried Japanese foods, is one of the most popular dishes in Japanese cuisine. It is also one of the most widely loved Japanese dishes in both Japan and the West and is often found on many restaurant menus. Tempura shrimp and assorted vegetables such as eggplant, Japanese pumpkin, and asparagus are quite popular in the West. Perhaps not as common, however, is sansai tempura. Sansai is a broad Japanese term which refers to a wide number of vegetables and herbs which grow wild on the mountains of Japan. Sansai is seasonally abundant during the spring and especially in the month of April. Sansai vegetables include vegetation such as taranomi, fuki, kogomi, and warabi. If sansai vegetables are difficult to find, try a variety of herbs and leafy vegetables as an alternative. For example, perilla leaves, baby kale, baby spinach, cilantro etc. Tempura is typically served with a warm soy sauce and dashi based dipping sauce and grated daikon radish. Another popular seasoning is plain granulated or sea salt. 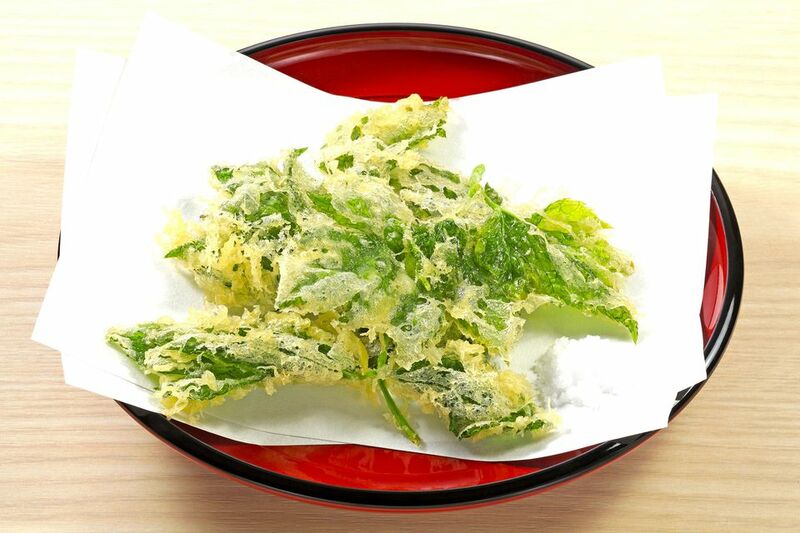 Alternatively, try tempura seasoned with matcha (green tea) salt. In a small bowl make the matcha salt by mixing together the sea salt and matcha powder. Set this aside to serve with the cooked tempura. In a small shallow dish, place a bit (1/2 cup or less) of rice flour. Set this aside. In a separate bowl, make the tempura batter. Combine 1 cup rice flour, egg, salt, and ice cold water. Heat oil until the temperature reaches 355 F or 180 C.
Break the sansai into medium pieces, with stems intact. Dip the vegetables and herbs into the dry rice flour and coat. Next, dip the coated vegetables and herbs into the tempura batter and quickly fry in the hot oil. It should only take 30 to 40 seconds to fry each herb. Drain the sansai tempura on a wire rack over paper towels.